The more you know, the better you grow! Plants are capable of interesting and unexpected things. Why do container plants wilt when they’ve been regularly watered? Why did the hydrangea that thrived last year never bloom this year? Why do slugs wipe out the vegetable garden instead of eating the weeds? 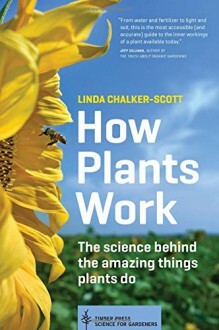 Plant physiology—the study of how living things function—can solve these and most other problems gardeners regularly encounter.In How Plants Work, horticulture expert and contributor to the popular blog The Garden Professors, Linda Chalker-Scott brings the stranger-than-fiction science of the plant world to vivid life. She uncovers the mysteries of how and why plants do the things they do, and arms the home gardener with fascinating knowledge that will change the way they garden.